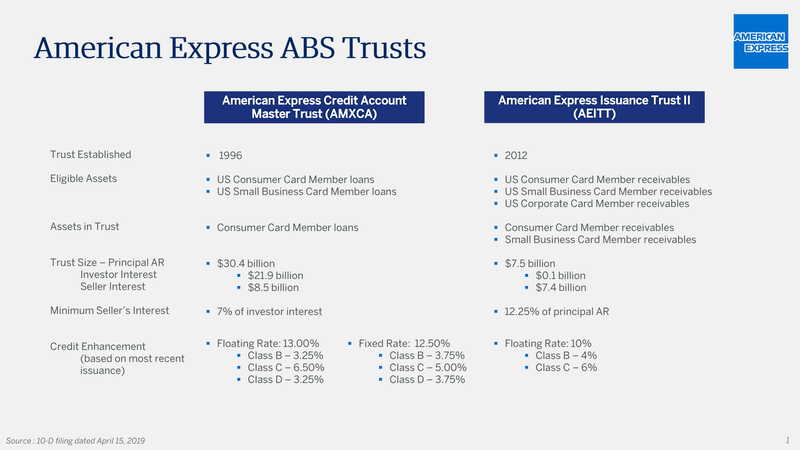 American Express periodically securitizes Card Member receivables and loans arising from its card business, utilizing two programs: American Express Credit Account Master Trust and American Express Issuance Trust II. The information contained on this web site is provided for informational purposes only and does not constitute an offer to sell or the solicitation of an offer to buy any securities. American Express Company and its affiliates and subsidiaries ("American Express") reserve the right to amend or revise any information contained on this web site at any time without notification. Documents contained herein may be amended, supplemented, or otherwise modified from time to time. Persons accessing this documentation at any time should understand that the documentation is subject to change without notice. Offering Documents and Other Materials Contain Dated Information. Offering documents prepared from time to time in connection with specific offerings of asset-backed securities issued by the American Express Master Trust and the American Express Issuance Trust (each, a "Trust"), and other Trust information, may be included on this web site. All such information contained on this web site speaks only as of the date the information was originally issued and may not be accurate as of any subsequent date. Historical performance information has been included in the following pages. Past performance is not indicative of future results. American Express has undertaken no obligation, and has assumed no responsibility, to update the information contained in any materials on this web site for facts or events arising after the date the materials were originally prepared. American Express assumes no responsibility for damages incurred in connection with the use of the information contained herein. Investment in asset-backed securities involves certain risks. The information contained on this web site is not sufficient or complete to make a decision regarding investments in securities issued by a Trust. Any reported performance results should not necessarily be considered indicative of future performance. Prospective investors should consult their own financial and legal advisors about risks associated with investment in a particular issue of securities and the suitability of investing in such securities in light of their particular circumstances.